New York City Opera officials are in preliminary talks about building on the site of the former Red Cross building on Amsterdam Avenue near 66th Street, where an opera house would sit below a residential tower. The New York City Opera is in negotiations to build a new opera house on the site of the former American Red Cross New York headquarters near Lincoln Center, the opera confirmed yesterday. City Opera officials met recently with Amanda M. Burden, the commissioner of the Department of City Planning, who described the project yesterday as if it were all but certain. Also at the meeting were the developer, A. &amp; R. Kalimian Realty, which bought the Red Cross site about 10 days ago for about $72 million, and the architect for the new building, Christian de Portzamparc, who designed the tower on East 57th Street that is home to Louis Vuitton's North American headquarters. Paul Kellogg, the opera's general and artistic director, emphasized that talks were preliminary. "We have been in discussions about this project, as we have about others," he said. "Nothing has been determined one way or another about this project." Steven Shokouhi, a partner at Kalimian Realty, declined to comment. Calls went unanswered at Mr. de Portzamparc's home and office, both in Paris. The opera house would sit beneath a residential tower. The plan would require the approval of the Planning Commission, the community board and other agencies. It has not yet been determined who would pay for the opera house or how much it would cost. City Opera has been trying for years to leave its current home at the New York State Theater, which it shares with the New York City Ballet, saying that the stage and acoustics there are better suited to dance than to opera. Until recently, its hopes had focused on becoming the cultural anchor for ground zero, for which it had proposed a 2,200-seat theater that was expected to cost about $300 million. 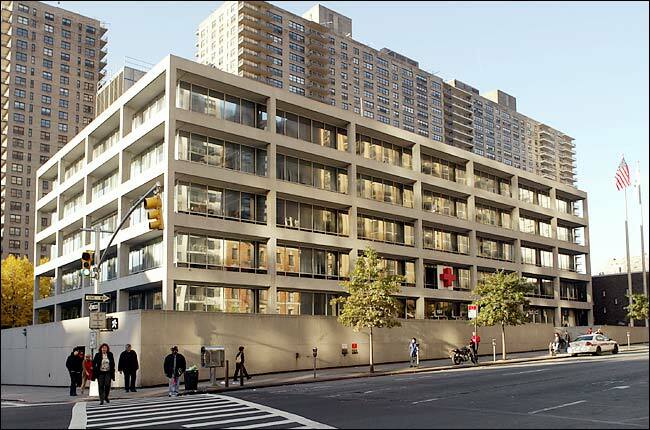 The Red Cross site, on Amsterdam Avenue between 66th and 67th Streets, is not zoned for a tall building, but Ms. 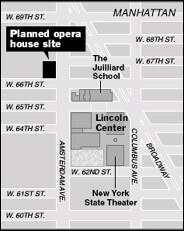 Burden said she expected that Lincoln Center would sell or transfer some of its air rights to the opera. Robert W. Wilson, a City Opera benefactor, said that would not be easy. "They're going to have a real problem getting all the constituents of Lincoln Center to give a gift of air rights to the builder and make sure the builder will include the opera house for a cost we can manage," he said. "I don't think we can raise more than $150 million." Concerning air rights, Bruce Crawford, chairman of Lincoln Center, and Reynold Levy, its president, declined to comment. When City Opera was considering the World Trade Center site, Mr. Wilson had withdrawn his original offer to contribute $50 million toward a new theater because he did not approve of the location. If the Red Cross option comes to fruition, Mr. Wilson said, he would reinstate his donation. "I would be very interested in supporting it in a big way," he said. "There is a good argument for the City Opera going there. Transit and parking facilities are so important, and they're there." In addition, building an opera house within a high-rise is less expensive than building a free-standing theater, Mr. Wilson said. Kate D. Levin, the Cultural Affairs commissioner, said the Red Cross possibility was nowhere near a done deal. "They are looking at all kinds of things," Ms. Levin said. "It's absolutely way too preliminary." Lincoln Center has expressed interest in keeping City Opera as one of its constituents; having almost lost the New York Philharmonic to Carnegie Hall last year, Lincoln Center was sensitive to another possible defection. Had the opera company moved downtown, it would probably have been too far away to maintain its connection to Lincoln Center. Jazz at Lincoln Center, which opened its new home in the Time Warner Building at Columbus Circle this month, has served as a precedent for expanding Lincoln Center's sphere. City Opera's departure would leave an opening at the State Theater. City Opera has a lease at the theater that runs through 2014, and it must fulfill its financial obligations there through that date unless another group replaces the lost income. Many expect the American Ballet Theater to fill the hole. It now uses the Metropolitan Opera House when the Met is not performing, but the Met recently pushed the theater's spring season further into summer, when it is more difficult to sell tickets. Peter Martins, the ballet master in chief of City Ballet, has expressed interest in starting a modern dance company to supplement City Ballet's season if the opera were to leave. The Alvin Ailey American Dance Theater is also considered a strong candidate for City Ballet's off-season; the company currently performs only five weeks a year at City Center, on West 55th Street. City officials opposed a move by City Opera to ground zero, in part because Mayor Michael R. Bloomberg was concerned about how City Ballet would fill the auditorium in the 27 weeks per year when it is not performing or rehearsing. In pursuing a place at ground zero, City Opera had proposed presenting outside dance, theater and opera companies. It was eventually passed over in favor of the Joyce Theater and the Signature Theater. City officials were also concerned that a new opera house might intensify the competition among sites like Carnegie Hall, City Center and the Brooklyn Academy of Music. In weighing City Opera's proposal for the World Trade Center site, some planners at the Lower Manhattan Development Corporation questioned the feasibility of putting such a large hall on the site. The Red Cross site would seem to offer ample space, as well as proximity to the West Side bus and subway lines. Gale A. Brewer, a city councilwoman on the West Side, said she found out about City Opera's interest in the former Red Cross site about a week ago. "I think it would be fabulous," Ms. Brewer said. "The opera is an institution that we want to keep on the West Side. It makes it a cultural mecca." At the same time, Ms. Brewer said she was concerned about the potential height of the building, having dealt with a similar situation at Symphony Space on upper Broadway, which was recently refurbished as part of a residential tower. "The question is how high they go above," Ms. Brewer said. "Residents are worried about losing their views." This could be a very exciting development for Lincoln Center. City Opera's proposed house was too big for Lower Manhattan; the 1,000 seat and smaller theatres for Ground Zero will be far more serviceable. On the other hand, City Opera remains at Lincoln Center and in command of its own performance space. The Rose Theater (Jazz at Lincoln Center) has also been designed for opera and seats around 1,000. This creates a phenomenal center/area for opera: classical, contemporary, mixed forms, and workshops. The arts campus expands and the area continues its development as an exceptional residential community. This is great news! I hope that they do something with Juliard also. It's a real eyesore! With a tower plopped on top and apparent budget constraints, this project may not hit a high note. The higher the residential tower the more profitable. If they depend on it for financing, they may encounter neighbor(hood) opposition and be forced to compromise. The city councilwoman makes no secret about representing private interests. De Portzamparc has experience in designing both music halls and highrises. The picture makes that building look nice. I don't know if I'm for or against this. I have to see it myself. Thinking about attending Turandot, since I love "Nessun Dorma" — definitely not a gala event, however; I don't have the proper attire, unless I sit waaaaaaaaay in the back. A nice suit will do on any other day. Also partial to Don Giovanni. Mozart's a genius. I love Turandot. It's my favorite opera. Anyway, I dress casual for work (i.e., Oxford shirt and Gap khakis), and whenever I go to the opera, I always go straight from work. I saw Die Walkure last month with Placido Domingo. It was superb! Just out of curiosity, since the Met has no dress code save for at gala events, is that unusual amongst opera institutions in other cities? In Paris or Rome, for instance, is formal dress generally a must? I don't know. The only opera I've attended outside of New York was in the Royal Albert Hall in London, and everyone was in casual attire there too. What other operas do you like? I've seen La Bome, Carmen, Eugene Onegin, Turandot, Die Walkure and Barber of Seville and have loved them all. Personally, I've only seen Boheme in concert, but I've seen Don Giovanni on video, have most of the score on my iPod, and have read the libretti. That's interesting. Opera is superb. I get the chills when I hear "Nessun Dorma"! Let's hope that we have a nice new venue to see opera in NYC!